Navigating sales metrics — and choosing which ones you’re going to monitor — can be an exercise in confusion. Ask anyone what the most important metrics are to a sales organization and you’ll get a different answer; or Google “important sales metrics” and you’re likely to get different results, no matter where you click. There are so many things you can track that you can get lost if you try to give every metric equal attention. And not everyone will want to track the same things. “It’s a bit misleading to say, ‘Track this, not that,’ because it all depends on your strategy and what’s important,” Mike Schultz, co-president of RAIN Group, said in an email. That might be true, but there are some basic metrics that every organization should know if they want their reps to be better closers. What are reps doing with their time? “When I manage salespeople what I do is I look at their calendar. The calendar, the diary tells me everything,” author and sales coach Steve Schiffman said. Schiffman said sales managers should pay attention to the number of appointments a salesperson has, and how many qualified proposals have been submitted to prospects. “What's important is the number of first appointments a sales rep has, and the number of proposals that have been submitted that qualify as having met these four criteria: I'm meeting with the right person, it's the right product for them, I'm talking about the right timetable and I have the right price on the table,” he said. If a rep can tick off these four criteria, it means they’ve got a 50% chance of closing a deal, Schiffman said. “Most managers don't ask those questions. they simply assume that the proposal is out there and it's qualified, but it doesn't mean anything if you're not talking to the right person or it's just more of a demonstration than it is an actual proposal or recommendation,” he said. Schultz suggests that sales managers create seller action plans. “(This is not) a metric, but do you know what your sellers are planning to do to hit their goals? Don’t know that and you end up wasting months and months while salespeople ‘float’ and don’t do what they need to do,” he said. A closing ratio — also called a win rate — is the number of deals a rep close compared to the number of contacts she makes. It’s simple math; if a rep makes 100 presentations in a year and closes 20 deals, her ratio is 20%. Knowing your team’s win rate will help you understand how your team has been spending their energy, and it will allow you focus in on behaviors that will help you improve that ratio. For example, Schiffman said, knowing his closing ratio can help a rep plan his schedule. Not all salespeople know how many appointments they’ve kept in a given year. They may — and probably do — unwittingly make the exact number of appointments every year, which won’t help them close more deals in the future. Author and sales trainer Mark Hunter of The Sales Hunter believes this ratio is one of the only metrics that matters. The other metric? The sales cycle. The sales cycle is the length of time it takes for your prospect to become your customer, or, in other words, how long it takes for a prospect to get through your sales pipeline. Knowing your pipeline conversation metrics — leads generated, opportunities, proposals, win rate, repeat business rate, average size of sale — is essential, according to Schultz. “Without these, you’re flying in the dark,” he said. It’s also important for managers to monitor the quotas and pipelines of the reps on their team. “People don't realize, don't accept that the sales cycle really determines your success,” Schiffman said. It’s important to understand how long it typically takes for leads to enter your pipeline and come out the other end as deals. Let’s say a sales cycle, from first contact to a close, normally takes eight weeks. If a prospect is still in the pipeline at 10 weeks, the rep should realize that deal may not happen. “I can predict the results of a salesperson by looking at their calendar and seeing what's in flux and what's outdated, what's dated itself out,” Schiffman said. “The longer a sale takes out of its normal sales cycle, the less likely it is to happen. 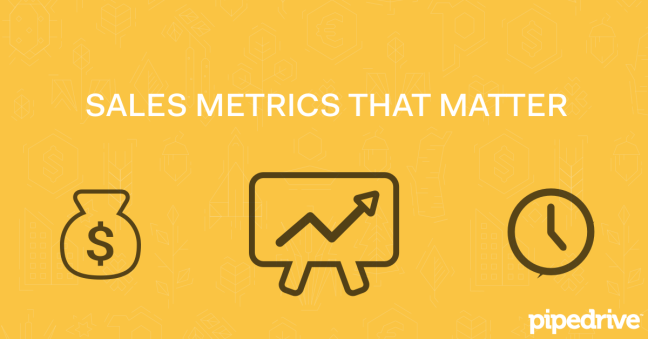 These are basic sales metrics that matter to everyone. All sales teams should know their schedules, their closing ratios and should understand how long it takes a prospect to become a customer. If you want to get more advanced about tracking your metrics, you’ll need to evaluate your organization’s goals and your team’s sales strategy, and choose the specific metrics to help you get there. If you liked this post and want to read more about metrics to help reach your goals, take a look at our tips for getting the most out of your pipeline.